The design of the single-component frame is a unique shape which allows a user to move the unit over a drum of material. A single user can then utilize the ram to raise the drum onto plates that elevate the material for use. This feature alleviates the need for multiple employees to lift heavy drums of material onto a platform. This process makes material drum change out easy and reduces the risk of employee injury. Control Panels Controls of the unit are conveniently placed on the side of the unit allowing the operator easy access to all operational features. These controls are clearly labeled and help cut down time required to train new employees how to operate the unit. Lights on the control panel alert employees when material is running low and help them prepare for material change out. 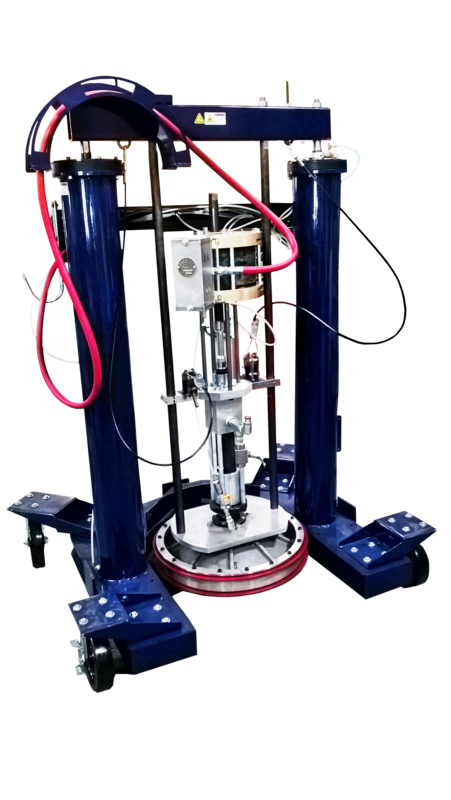 Frame Design New frame design combines easy loading of material with operational controls and rugged pump design to provide a more user-friendly experience in dispensing single-component materials.